Victoria Road (currently known as the Chigwell Construction Stadium, for sponsorship purposes) has a capacity in excess of 6,000. The old terraced away end behind the goal was demolished in the summer of 2009 and replaced with an all seated stand to comply with government standards. The total amount of seats now account for 2,200 heads within the stadium. The Bury Rd End stand is an open terrace and opposite is the newly built Traditional Builders Stand. The Main Stand is a small all seated stand approximately 8-10 rows deep. Visiting supporters are situated in the newly built Traditional Builders Stand. The facilites, leg room and view of the action are excellent from here and up to 1,200 away fans can be catered for. Refreshments include all the usual suspects and are of a very good standard for very reasonable prices. There is a social club situated at the stadium which welcomes away fans for a very small fee. There's a large hall inside with a big screen showing Sky Sports so you can watch the early kick off's before going in to watch the game. They offer a selection of food and drinks and it's a very friendly environment so it's well worth a visit. Parking is available along most roads surrounding the stadium. The main road leading to the stadium is restricted but all side roads are accessible. There is also a small amount of free parking available at the stadium itself. However, this needs to be booked in advance. 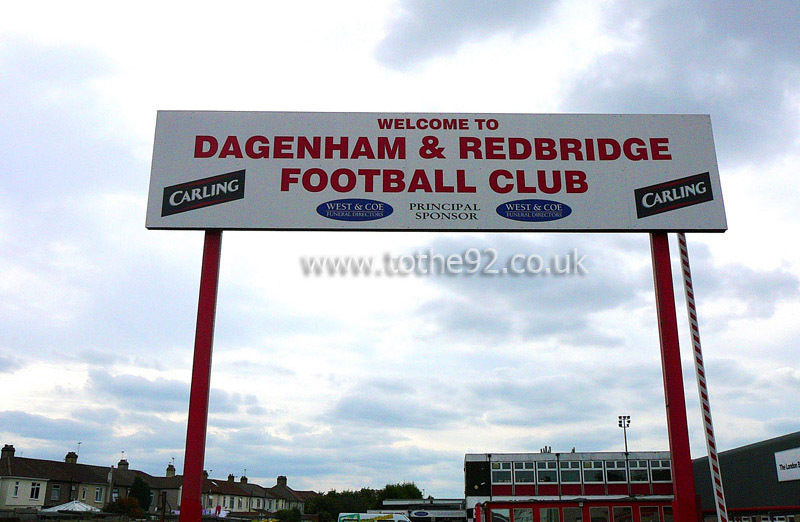 The nearest / closest train station to Dagenham & Redbridge's London Borough of Barking and Dagenham Stadium is Dagenham Dock. Though this is just under 2 miles from the stadium so you may be better advised to jump on the tube. The nearest tube station is Dagenham East which can be found on the District Line. If visiting central London before going to the game be advised that the trip to the ground can take about 40 minutes. Once out of the tube station turn left, and the ground is approximately 5 minutes walk and is clearly sign posted. Travel: After a horrible day travelling through London to Palace a week earlier, I asked for some advice on avoiding that for this one! Took the advice to drive and park at Upminster Station at the east end of the District Line, and it was just 4 stops to Dagenham East, and a five minute walk from there. Couldn't have been easier. Once I got there too, to be honest, I dont think I would have minded driving all the way either, as Dagenham is on the outskirts of London enough that there isn't a lot of traffic, and there was lots of street parking that you normally have to pay for, but is free on Saturdays or after 6.30 on week nights, so its not like parking would have been a problem either. Refreshments: Not a whole lot between the ground and the station, but a little row of shops that at least has a couple of cafe's and chippies on. Being an ex-non league ground too, the ground has a really good sized club house too where away fans were welcome, and with Sky TV as well. Cheap too and they served Coke in glass bottles, so cant go wrong really! Food inside the ground was a decent selection too, though cant comment on the quality. Impressions: The ground isn't bad at all really, with all seater on two sides, and terrace on the other two. The away fans get the best stand in the house, in the Traditional Builders Stand, a brand new all seater stand behind the goal with no pillars and is even raised above pitch level so even at the front it wouldn't be too bad. 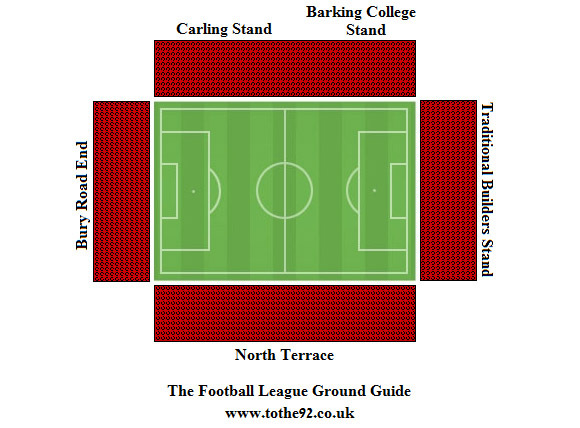 The Carling Main Stand is also unobstructed, though a small stand, with the odd little Barking & Dagenham College Stand filling in the gap at the end of the stand, as the Main Stand only covers 3 quarters of the pitch. Then the terraces, which are joined in the corner, so you can ‘swap ends’ as such. The North Terrace is covered and runs the lengths of the pitch, while the Bury Road End (or Clock End) is the only stand that looks like it needs a bit more work, being small, shallow and uncovered. Atmosphere: Not the best to be honest, picked up a bit later on in the second half, but still pretty poor. They had a drum…I was stood at the opposite end of the North Terrace to the drummer in the first half, and all I could hear was banging every now and then with no singing to go with it! Enjoy: Easy to get to, relaxed, not bad at all really all round! Have you been to Dagenham and Redbridge's Victoria Road? To tell us about your experiences and to feature on the site, simply complete the fans review form below!